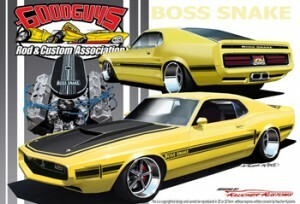 Goodguys is proud to announce the 2010 Grand Prize Giveaway Car – the 1970 Boss Snake. The Boss Snake is a Retro Boss 429 headed 466 Ford powered super muscle car designed by Kaucher Kustoms being built by RPM Motor Sports of Warrendale, Pennsylvania. RPM Motor Sports is the winner of the 2009 Good Guys Street Machine of the year award for their wicked black ‘69 Firebird convertible .The Boss Snake is a concept based on the “QuarterHorse “A Ford internal design study based on a’70 Boss 429 Mustang of which two prototypes were built. The car’s finish will be PPG/Goodguy yellow. It will feature a complete Air Ride suspension system and powered by a Jon Kaase-built 466 Ford hemi motor, making and incredible 771 HP, backed by a Tremec 6 speed transmission, custom one-off Intro Wheels designed by Kaucher Kustoms and many other unique muscle car performance parts and accessories. Conceived as a possible replacement for both the Boss 429 and Shelby Mustangs, the so-called QuarterHorse Mustangs were built from actual Boss 429 Mustangs by the Kar Kraft company in Brighton, Michigan. Also referred to as the “Composite” Mustang, it contained several different parts and pieces than the original BOSS 429 Mustangs. The body was standard 1970 Boss 429, the front clip was Shelby Mustang, less the hood scoops, and the dash was Cougar. The first Quarterhose, KK 2061, was painted Grabber Blue and was initially fitted with a Boss 429 engine. It was soon replaced with a 429 SCJ and sent to Hollywood to star with Burt Reynolds in a short-lived TV series called “Dan August”. The second Quarterhorse was Candy apple Red and was fitted with a 429 SCJ engine. Amazingly, both Quarterhorses survived the crusher and are in the hands of collectors. 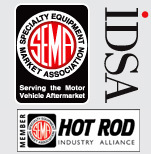 Project sponsors include: Vintage Air, Classic Instrument, Painless Performance, BFGoodrich, Flaming River, Ricks Hot Rods, Dynacorn, Baer Brakes, Tremec, Optima Batteries, Herculiner, PEAK, Grundy Insurance, Flowmaster Exhaust, Comp Cams, Performance Rod & Custom. Visit the Good Guys website to read more. This entry was posted on Tuesday, February 2nd, 2010 at 11:02 pm and is filed under Blog . You can follow any responses to this entry through the RSS 2.0 feed. You can leave a response, or trackback from your own site.